Many of the ‘supporting’ technologies developed by the oil & gas sector for its floating production vessels – led by mooring and anchoring – will be key to commercialising floating wind power. Cost remains the main obstacle to the commercial viability of floating wind power projects today, with a significant overhead linked to mooring and anchoring. Our industry has now reached a point where many technology owners have proven concepts, but a shift in thinking is needed to take our campaign on capital expenditure (Capex) to the next level. Capex estimates are, of course, contingent on the different designs being advanced for floating wind turbines, but it is anticipated that mooring and anchoring could typically comprise up to 20% of the total costs of an offshore project. For complex deployments and extreme water depths – which is central to the long-term play for floating wind – this figure could be substantially higher. And floating wind needs to cut costs significantly to move into the mainstream as an energy source – the French government is be commended for supporting four 25MW arrays now on the drawing board for installation in the Mediterranean and Atlantic starting in 2020, but that they had to provide a feed-in tariff of €240/MWh ($282/MWh) for 20 years is telling. The good news, however, is that recent technical innovations and a new approach customised to the sector is being initiated and starting to have a positive impact on floating wind. One of the key point of leverage lies in a shift in thinking: the oil & gas offshore sector has a fantastic legacy and a unique expertise to support floating wind power and other marine renewables. This knowledge base runs the length of the value chain, from hydrodynamics and mooring analyses, through risk-based structural assessment design, to third-party approval management. The actual challenge is to apply this knowledge in suitable and innovative ways, starting with a wide-ranging set of initial inputs. Indeed, when compared to a floating production, storage and offloading (FPSO) unit used to produce offshore oil fields, a floating wind turbine is different enough in term of Capex, potential risk and daily production output value to justify adapted regulations and certifications processes. For example, a floating wind turbine is unmanned, so this should be a factor classification societies consider when adjusting their assessments in approving safety standards and redundancy requirements for station-keeping of a unit. At the same time, using the oil & gas industry’s high health, safety and environment specifications will help floating wind from falling into the trap of potentially ‘lower-quality’ solutions at a time when it needs to develop a industrial reputation for reliability. It should be remembered that by the time the first floating wind farms will become a reality, they will likely be powered with turbines of at least 10MW – if not into the 12-15MW range – with rotor diameters of some 200 metres. The coupled loads generated by a turbine on this size of floater will be huge – potentially up to 20,000kN per mooring line – and the units engineered for a lifespan of 25 to 30 years. These are challenging requirements that need to be addressed properly from the outset. Oil & gas can help. The path forward should be a perfect blend of existing solutions – single-point mooring for instance, such as are used to anchor some FPSOs on marginal fields at a competitive price – with relatively new technologies, including in-line shock load dumpers, elastomeric fibers and so on, to achieve a suitable strength and lifetime of the systems at the right price. There are also interesting investigations into the possibility of developing mooring spreads that share anchoring points. 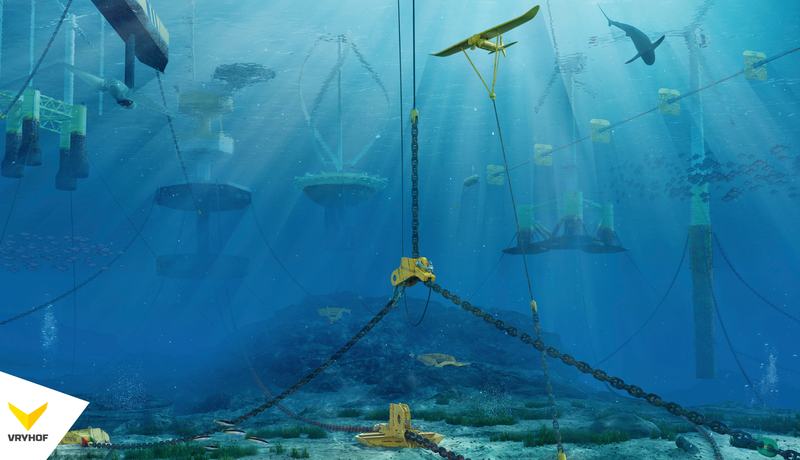 Developing floating wind farms with a ‘networked’ mooring system will mean fewer unit anchoring points and a streamlined approach to geotechnical site investigations – both of which will cut the cost of future projects. Installation currently accounts for about 50% of the mooring package, so it should be looked on as a priority in order to also optimise offshore construction time and decrease the installation vessels requirements. The use of Vryhof’s Stevtensioner system for the installation of WindPlus’s WindFloat demonstrator few years ago off Portugal is a good example of potential technology transfer between oil & gas and floating wind. Field-proven for more than 20 years, it allows for two opposing anchors to be cross-tensioned simultaneously in constrained areas. Reduction in the required bollard pull capacity and use of winches instead allows the use of smaller and cheaper vessels as part of the installation process. While mooring and anchoring is only an ‘enabler’ to some of the exciting developments in the floating wind power industry today, the focus on innovation and pushing the boundaries in hatching novel technologies will ensure that it plays a crucial role in the viability of marine renewable energy for many years to come.